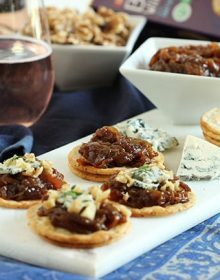 top all your savories with this sweet onion marmalade! In a medium skillet, heat the olive oil and butter until the butter is melted. Add the onions to the pan and cover. Cook the onions until softened and they begin to caramelize stirring occasionally. Add 1/2 the water to the pan, cover and continue to cook until the water has evaporated. Add the remaining water, sugar, orange juice, zest and vinegar. Cover and continue to cook until the onions are a deep brown color. The whole process will take between 30-40 minutes. Season with salt and pepper to taste. Allow the marmalade to come to room temperature and store in an airtight container.